Facts: When fully grown, the Marianas Fruit bat weighs about 1 pound and can have a wingspan of up to 3 feet. they have dark brown or black wings are brown on the head with a gold/pale brown neck region. These bats live in colonies that consist of up to several hundred members. They enjoy eating fruits such as papaya, bread fruit, mango, pandanas, and flowering fruit trees. 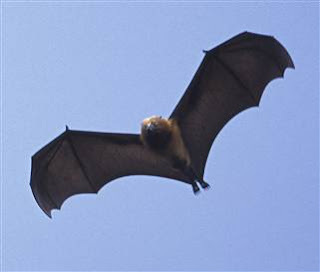 Due to illegal hunting, the population of these bats has declined significantly. They are really sensitive to human disturbances and habitat destruction.